Super Smash Bros. has an identity crisis. Fifteen years after the series’ debut as a modest Nintendo 64 experiment where the company’s iconic (and not so iconic) characters duke it out in hand-to-lightning-to-sword combat, it has come to mean different things to different people. On one end of the tug-of-war are the fans who play Smash Bros. the way Nintendo originally envisioned it—as a chaotic, vibrant spectacle where cutthroat competition takes a backseat. On the other is the sect of smashers who prefer to strip away the game’s elements of luck and turn it into a less adulterated test of fighting skill. While the just-for-fun camp might have the numbers advantage, the serious competitors have been yanking harder on that rope for years, fueled by a passion for the breakneck pace and complex techniques (both intended by the creators and accidental) that have come to define Super Smash Bros. Melee on the GameCube. With this newest iteration, first available as Super Smash Bros. For Nintendo 3DS, Nintendo has taken up the challenge of pleasing both sides. And in this portable version, the studio also tries to contain the series’ anarchic brawls on the 3DS’ tiny screen and inferior buttons. (A console version of the game will be released later this year as Super Smash Bros. For Wii U. Yes, these are the actual titles.) That tug-of-war over its identity can still be felt raging underneath the surface, but ultimately this new Smash Bros. is a robust, happy middle ground, even when the 3DS is struggling to keep up. The fighting at the core of the game has benefited from the compromise. While it’s not nearly as fast as Melee—which, when revisited after spending time with slower Smash games, is nigh unplayable for a few matches while hands and eyes adjust to the madness—it has been sped up relative to the methodical Super Smash Bros. Brawl. The speed allows for a satisfying fluidity, both in the feel of the controls and in the animations of the characters as they flit and fight. New visual flourishes give greater impact to hits, with lightning bolts that erupt from the epicenter of fatal blows. All of these changes and superficial details lend the new Smash a strong physicality, perhaps in part because Nintendo handed off some development duties to the same people who worked on the Soul Calibur and Tekken series at Bandai Namco. What’s most impressive about the new Smash Bros. is its massive scope, starting with a huge cast of characters. There are 49 combatants in total, 15 of whom are completely new to the series, and they’ve been drafted from every corner of Nintendo history. The same goes for the vast selection of items that can show up (if you choose to include them in the mix). A few previously absent no-brainers like Mario Kart’s pesky blue shells and a swarm of angry Zelda chickens join the standard Smash Bros. fare of warp stars (from the Kirby games) and bob-ombs (Mario). There are tons of pokémon to summon and destructive character cameos to activate mid-match. Nearly every facet of the series has been blown out, made bigger, louder, and crazier. The 3DS, though, is not always the best vehicle for chaos at this scale. When playing with all the bells and whistles turned on, the handheld’s screen can get overcrowded. The tiny characters get lost in a collage of explosions and pokémon and appearances from murderous, lesser-known Nintendo creations. This is less of a problem if you’re the type that enjoys the quieter game, the Smash Bros. without the items or living arenas that are more of a hazard to you than your opponents. But while the 3DS’ screen real estate is better suited to the game at its bare essentials, its buttons and saucer-like thumb nub can’t support the precision that fast and furious expert Smash play demands. In this case, both sides of the tug-of-war are getting burned. I’m happy to trade some precision for the chance to fill boring moments with Super Smash Bros., though, and obviously that’s what this “For The Nintendo 3DS” version does best. There’s no grand, multi-hour story mode like Brawl’s “Subspace Emissary.” Instead, Nintendo wisely focused on adding new activities that the solo smasher can squeeze into a couple minutes of free time. While your plain and simple “Smash” match might still be the best quick hookup, the 3DS-exclusive “Smash Run” mode is an unexpected pleasure. Players get five minutes to run through a map full of treasures and randomly placed enemies (once again hailing from all over Nintendo’s various universes—you could be forced to fight a Mario Hammer Brother, a Zelda ReDead, and an EarthBound Starman all at once). Along the way, you’re trying to collect colorful badges that power up their character’s speed, strength, and jumping abilities. Once the five minutes are up, you and the three other competitors (either player- or computer-controlled) are dumped into a final challenge to determine the winner. 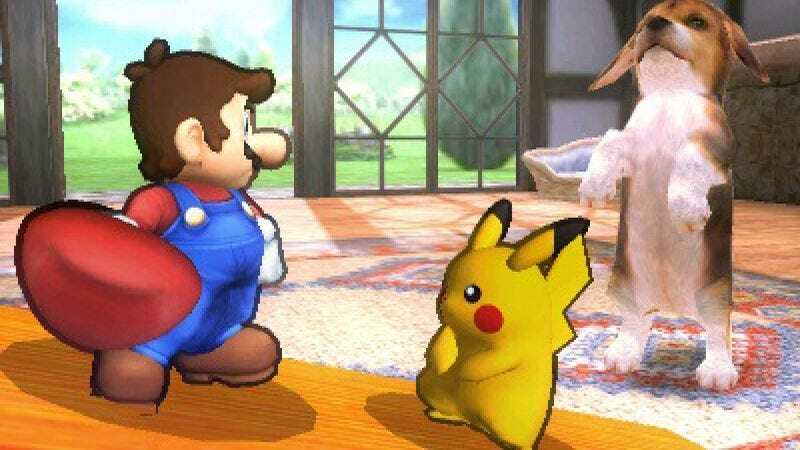 It’s here that the new Smash’s customizable characters most come in to play, as tweaking your favorite fighters’ moves and giving them “Smash Run”-specific superpowers is necessary to make it through the five minutes unscathed. The special powers and alternate moves don’t come easy, though, and have to be earned through the game’s single-player modes. Oddly, you can’t use the bespoke characters in every mode. It makes sense that they would be banned from online play, but outside of “Smash Run” and the “Classic” mode that pits you against a ladder of progressively more complex and difficult fights, they can’t be used in any of the single-player activities, either. While that’s a minor detail, it feels like an arbitrary denial of the “everything and the kitchen sink” attitude that the game flaunts elsewhere—one of those rare moments where the developers fell victim to the lack of a single unified vision for the series. While going solo is as entertaining as it ever was, the 3DS is ill-suited to the long multiplayer sessions that Smash Bros. is known for. Online play is possible—with competition divided into “For Fun,” where items live, and “For Glory,” where items are banned—but this was tough to test before the game was made available stateside. Every random match I played was against people in Japan, and the resulting lag meant that most matches either became a choppy slideshow or took place in perfect slow motion. The few online matches I had with stateside smashers were better but far from uniformly smooth. Even the brawls I fought against friends in the same room on separate 3DSes had their share of periodic stuttering, though not to the point where it soured the festivities. The new Smash’s “more more more” spirit is especially beneficial to the 15 new characters. Beyond the familiar maneuvers that many of them borrow from past cast members are unique twists that are more complex than anything Smash has seen before. The expanded range of attacks gives the developers yet another way to play with the history and idiosyncrasies of the fighters. The Wii Fit Trainer can use her/his yoga poses and deep-breathing exercises to heal and unlock inner strength. Shulk, from the Wii role-playing game Xenoblade Chronicles, can use magic to strategically, temporarily buff up one of his individual statistics—making him speedier or harder to knock off the stage for a kill, for instance. Even the weapon degradation in Fire Emblem: Awakening is incorporated into Awakening hero Robin (making a Smash debut here), as his/her spellbooks and swords break after a specific number of uses. These complicated characters are a breath of fresh air, one of the game’s more obvious nods to the players who prefer the stripped-down Smash. The nuances get lost in the shuffle of an all-out Smash war, where dashing from powerful item to powerful item can take precedence over tactical maneuvering. When items and other unpredictable elements are disabled, however, the rookie characters’ repertoires are given the time and space they need to shine. Still, the new Smash does a remarkable job of making all of its characters—not just the new ones—worth playing. I often would let the game choose a fighter for me. This is a testament to the work the developers have done to amplify not just Smash’s signature arsenal of nostalgia-inducing items, arenas, and fighters but also more minute details, like the way characters move and control and the satisfying impact of their strikes. The attempt to appease both camps of Smash fans—those who play “For Fun” and those who compete “For Glory,” as Nintendo has put it—does far more good than harm here, making Super Smash Bros. For Nintendo 3DS the best of both worlds.